Every year approximately 8 million tons of plastic waste finds its way into our oceans, where it wreaks havoc on our wildlife, and then finds its way into the human food chain. 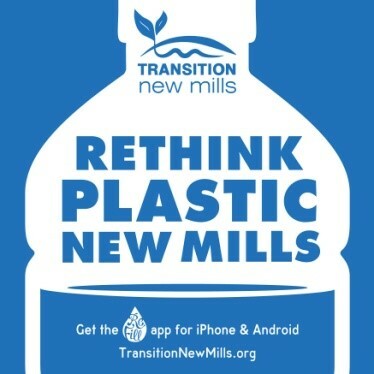 The campaign launched in October, when Transition members and friends were on the Market St Prom to share ideas and advertise the first initiative, Refill New Mills. Refill is a nationwide scheme – http://www.refill.org.uk – to reduce the amount of bottled water sold. Several of our great local shops and cafes have agreed to provide free tap water refills, with no obligation to buy food. The business gets a sticker, to attract passers-by – cyclists, walkers, and shoppers. In return, they will hopefully get increased footfall into their business. They also appear in the Refill app map. We are very encouraged that we are now able to widen the campaign as Rethink Plastic High Peak. after getting support and interest from Transition Buxton, Whaley Bridge, Sustainable Hayfield , and activists in Glossop and elsewhere. We are hoping that the Refill Scheme, for starters, will be well used in all these places.